The Starfrit rice cooker and vegetable steamer set is something to get your creative juices running. And to keep them in! As you expect, it is a rice maker giving perfect fluffy rice. The lid locks on and a specially designed additional insert catches and recirculates steam, so your kitchen does not get messed up and the grains puff up. Finally you serve with a specialised rice spoon, also included, which protects the rice to help prevent clumping. Time to do some vegetable steaming. As the microwaves are providing the energy without needing to conduct heat, less water and fat are needed. We know that vitamins and minerals leech into water, here they are kept in the vegetables, meaning much healthier food. And as there is a draining basket included, you can lift the vegetables out and use the juices as stock for soup. 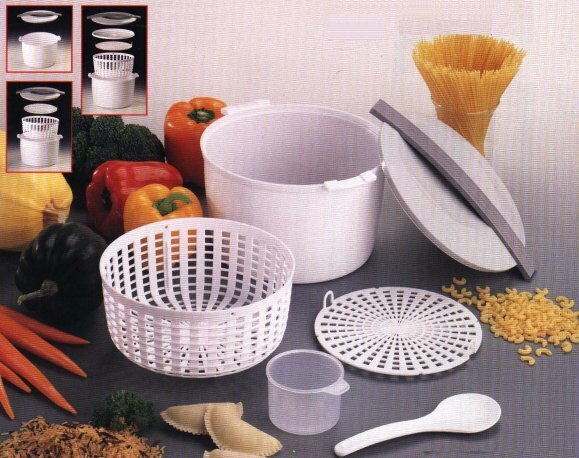 Also use this basket insert for cooking and draining excellent pasta. The timer on your microwave also cuts down on the risks of over cooking and softening. Children and people who don`t like vegetables may change their views once they taste them steamed, crisp and sweet without mush. We all know the misery of cleaning burnt pots and pans, multiply that for an electric rice cooker with baked on food and areas you cannot get wet. By contrast the Starfrit rice cooker and vegetable steamer set just goes in the dish washer. If all this were not exciting enough, these are special packs with extra goodies in, like a gadget to squeeze pastry into delightful filled pies and measured amount releasing salt and pepper pots. This set may be the ultimate in microwave cookware. Microwave Rice Cooker text, images and video are copyright.